Vero Software is pleased to announce the availability of Edgecam 2018 R2 SU8. The 2018 R2 Release contains 54 items of new or enhanced functionality which improve productivity for manufacturers using a range of cutting technologies and machining strategies. About Vero Edgecam 2018 R2. The 2018 R2 Release contains 54 items of new or enhanced functionality which improve productivity for manufacturers using a range of cutting technologies and machining strategies. The way the 'Pre-Drill' approach strategy is handled, has been significantly improved within the Roughing cycle. Rather than manually create drill hole positions, which is sometimes time consuming, Edgecam 2018 R2 automatically creates the hole position and keeps the drilling toolpath associative to the Roughing cycle. Simply by activating the command, users can deploy the multi-level and depth functions within a hole cycle, to automatically locate the best entry position for the drill cycle. The Rough Turn cycle includes several new lead parameters allowing the user to roll in and out of each cut with a tangential arc. A bi-directional toolpath can be created, allowing the cycle to be used in conjunction with Sandvik's CoroTurn Prime turning inserts. Significant time savings and reduced tool wear can be achieved when adopting these methods. Also, the cycle's collision detection capability has been extended by automatically removing any potential crashes between the tool and the tailstock. 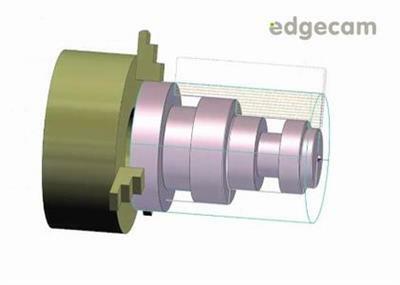 Edgecam Inspection module's evolution continues with 14 enhancements, including full postprocessor support from with the Code Wizard. Major items include the introduction of NC Gateway, which communicates with the machine tool, plus 'Best Fit' calculation, which allows alignment of the workpiece. As well as the new 'Inspect Rectangle' feature, both the 'Options' and 'Inspect Toolpath' dialogs include new features. Users may now influence both the Work Datum and the Tool Offset, and view the status from within the NC output and the Inspection Report. Through improvements in the toolpath algorithm, Edgecam 2018 R2 provides a significant performance improvement with the 'Pick Solid Faces' function. Time savings of over 50 per cent can be achieved thanks to the manner in which the cycle gathers data for toolpath calculation. Users will also gain further benefits when using the Multi-Pass function as the strategy is now supported with helical capability. Edgecam Designer's 2D Drawing Module creates views and sections of the 3D model in the Designer file. Features include dynamic view creation, shaded and wireframe views, fixed and variable sections, detailed views, and outbreaks. The 2D drawing and its associative dimensions can be updated when changes are made to the 3D model. The many sketching and modelling enhancements throughout Edgecam Designer include the Active Sketch Plane, which allows wireframe to be created directly onto solid and surface models, without the need for workplanes. In addition, it is now possible to create the Projected Area of solid and surface models, and new analysis functionality calculates aspects such as area, volume, perimeter, and center of gravity. Edgecam 2018 R2 now unlocks the ability to deploy workflow strategies where ordinarily a feature couldn't be created, by converting line and arc data into a solid Feature. Once machined the new feature can be edited and the toolpath will remain associative. Found in both the milling and turning environments, the Thread Mill cycle has been enhanced to allow closer toolpath control and greater flexibility. Five new parameters allow users to deploy 'peck' and 'multi-pass' toolpaths. This will especially help when machining hard materials or when a better surface finish is required. Further new options found in the Lead tab, give additional control with toolpath ordering. 3D milling cycles in the Mill/Turn environment have now become available whilst in working Rotary mode. Previously, these cycles were restricted to Planar mode. This enhancement offers greater flexibility in not only unlocking the seven milling cycles which were normally unavailable, but allows users to overcome machine tool limit issues". When being forced to use the same tool number but for different tools, programmers in the turning environment can now use the 'Replace Active Tool' function, so the simulator will only display a single tool in the turret during playback. And users can now increase playback performance by using the new 'simplify solid mill cutters' command. When using complicated solid model cutters, the function will simplify the profile by converting it into a silhouette. A good example are the three enhancements found in the 'Preferences' section of Edgecam 2018 R2. Users now have the choice to activate a toolkit by simply using the new 'Automatically Create Toolkit' check-box. They can also use the new 'Job/Toolkit Update' preferences settings when generating NC output. And the new 'Technology warning' check-box helps avoid mis-representing tools feed and speed settings. Manufacturers working with turning tools can now pre-state the 'CSS' condition from the tool store. This avoids individually setting the status every time the tool is chosen. In the case of Face Grooving tools, programmers can now add further details to the description of the tool by adding 'Maximum/Minimum Diameter,' which is particularly useful for Strategy Manager authors. Still with turning, Edgecam 2018 R2 allows any tool type to be deployed when executing the Thread Turning cycle. Edgecam 2018 R2 introduces 28 new technology databases to the Wire EDM module, including the popular Agie, Fanuc, Makino and Mitsubishi controllers. During the machine simulation stage, the 'start hole' (entry position for the wire) is created automatically - alleviating the need to manually create the hole in the stock."